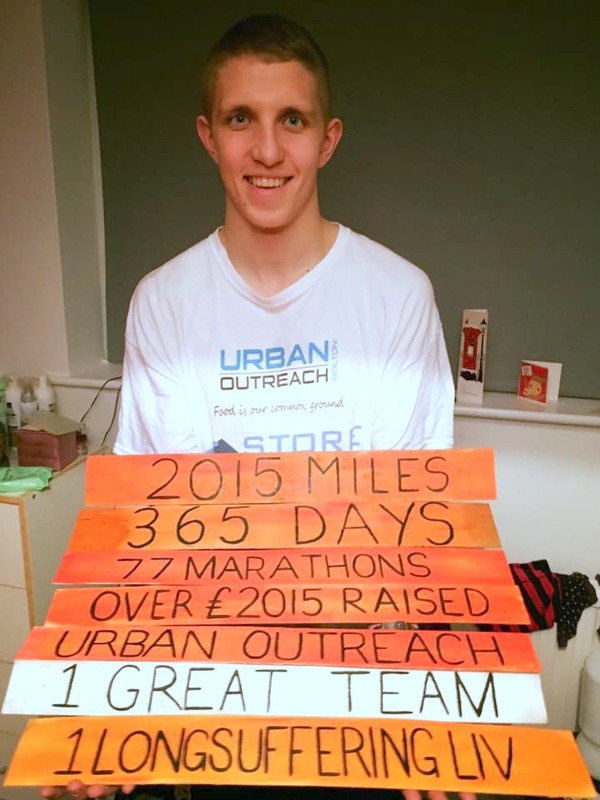 Urban Outreach Bolton – 2015 miles in 2015 to raise £2015! Home / Urban Outreach News / 2015 miles in 2015 to raise £2015! A keen marathon runner has honoured his pledge to run 2015 miles during 2015 to raise money for local charity Urban Outreach. Sam Walsh, who along with his family, is a long-time supporter of the charity set himself a target to raise £2015 in 2015 by running 2015 miles. He achieved his target by completing the final four miles on New Year’s Eve running round Egerton with a group of family, friends and supporters, raising a final total of £3077. A teacher, Sam has spent all his spare time training and running in a variety of races over the last year and has run the equivalent distance of 77 marathons. He completed five marathons including the Bolton Hill Marathon over Rivington Pike, and the London Marathon in April with a time of 3 hours 2 minutes. He came ninth in the White Rose 100km Ultra Marathon in November with a time of 12 hours 39 minutes. He has worn out several pairs of running shoes and continued his quest even when he was knocked off his bike in June sustaining face and knee injuries.